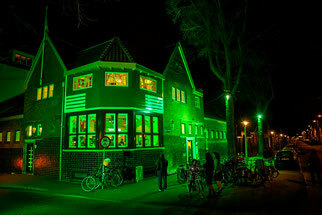 The venue for St. Patrick's Festival is Splendor, a music centre in the heart of Amsterdam and currently causing a huge buzz on the Dutch music scene. In 2015, Splendor was awarded the prestigious Amsterdam Funds for the Arts (AFK) Culture Prize. A collective of prominent classical musicians, composers and other performing artists have transformed a dilapidated old bathhouse in the heart of Amsterdam into their own performance space. They called this space Splendor where music is programmed, produced and performed by the musicians and where performer and public inspire one another. Among the musicians are principal players of the main Dutch orchestras such as the Concertgebouw Orchestra, Rotterdam Philharmonic and the Radio Orchestras, as well as names from the world of opera, jazz, electronics and ethnic music. The former bathhouse near Waterlooplein in Amsterdam has been renovated and houses 3 intimate concert halls for 100, 60 & 30 people. Splendor is set up as a club, run by the musicians. Financing for this venture doesn’t rely on government subsidies but on the musicians themselves and club memberships. For a yearly membership fee of €100 an audience club member has exclusive access to 50 performances a year given by the 50 performing artists connected to Splendor. The aim was to have 1000 members before the doors opened in 2013 and this has easily been achieved. To finance the renovation costs of the building, Splendor issued ten-year bonds at €1000 a piece, the dividend of which will be paid out in music ie one bond entitles one to a concert by one Splendor musician, 4 bonds a quartet etc. An important part of Splendor is its commitment to children, the belief being that music is elementary and that every child has a right to be given the chance to express his/herself through music. Splendor is a centre for regular workshops and performances geared to children, organised by Splendor Kids, founded by Aisling Casey. In the evenings it is a club where top musicians perform exclusively for their Splendor club members. If you have a love of music and want to be part of this initiative for just €100 a year, join here and benefit already from the Splendor member discount for the St.Patrick's Eve concerts.